BAT BOY: THE MUSICAL is ridiculous. That’s a compliment because it is supposed to be. Falcon Theatre, the little-theatre-that-could, has a knack for producing offbeat, hilarious, and unusual shows working with a smaller budget than say Ensemble Theatre or Playhouse in the Park, somehow finds a way to produce shows that appeal to a broad audience while maintaining their quirky sense of humor. When BAT BOY: THE MUSICAL premiered on off-Broadway in 1997, gaining critical acclaim and awards and I can see why. It’s a good story, with a lot of wit and charm and enough heart to satisfy my sappy thirst. This production has all of that, too. I was impressed with several in the cast. Gregory Good shines as “Sheriff Reynolds” and sets the bar for vocals early on in the show. Some exceeded this expectation and some fell short, but overall I was pleased with the musicality. Musical Director Jay Myers handled this cast and material nicely. Also enjoyable was NKU student Katelyn Altieri as “Shelly.” Falcon has an informal relationship with NKU and its nice to see many of their students and grads honing and displaying their craft on a Northern Kentucky stage. Jen Drake, who plays “Meredith Parker,” holds her own as an actress and singer as is the featured female performer in the show. She brings a level of gravitas to her performance that keeps this show grounded. Kudos to director Charlie Russell (read an interview with him here) for maintaining a balance of over-the-top humor and emotional sensibility. The crowd really enjoyed the show and many leapt to their feet during the curtain call. I saved my standing ovation for Robet Breslin, however, who absolutely owned the role of “Edgar.” This character moves on a trajectory from savage beast to refined young man and Breslin was effortless in portraying this evolution. I really appreciated his subtle touches and was mesmerized by him especially in the scene where he learns to talk. I’m so glad that Russell didn’t find the need to rush his actors as they worked through teaching the bat boy how to talk . . . others might have been tempted to speed up the pacing. But this moment is where I fell in love with Edgar and its the emotional center that holds the show together. Breslin has a lot of talent and I hope to see him more on professional stages like tis one around the city. I’m partial to this underdog company, of course, because I recently appeared in my first ever acting role as Chief Bromden in ONE FLEW OVER THE CUCKOO’S NEST on their stage. But also, I have high expectations because I know what this crew is capable of. And while BAT BOY is not a perfect show, it is a good one and it is definitely a fun night out at the theatre. 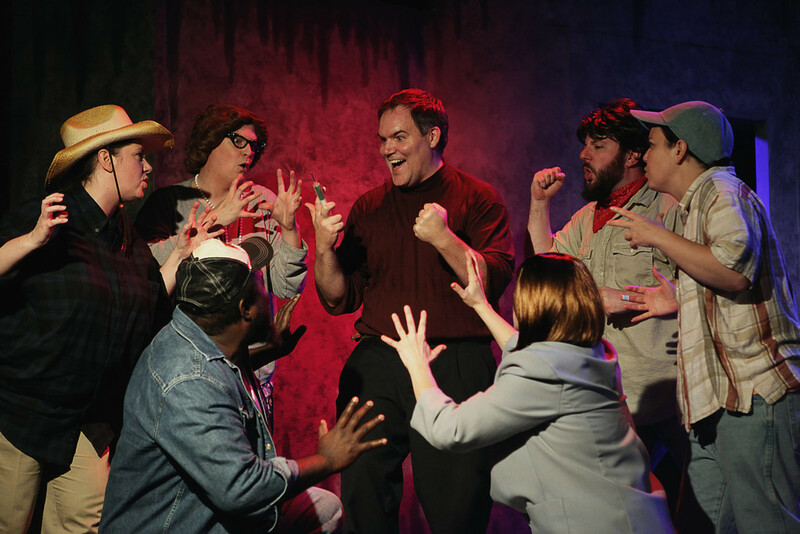 BAT BOY: THE MUSICAL Performances are at 8 p.m. May 16, 17, 23, 24, 30 & 31 at 636 Monmouth Street, Newport KY, 41071. Tickets are $20, $17 for students and seniors and available at Falcon’s website or by phone at (513) 479-6783.